On September 23, 2012, the Space Shuttle Endeavour has finally retired after 20 years of service in the space mission program of the United States. Built in 1987, the maiden voyage of the shuttle was in May 1992 and the last journey was in May 2011. Records show that Endeavour has completed 25 flights and travelled approximately 123 million miles for the Space Shuttle program of US space agency. Endeavour will now become a treasure in the California Science Center in Los Angeles together with the other retired space shuttles – Discovery, Enterprise and Atlantis. It was in July 2011 that US ended its shuttle program after 30 years of space missions. To mark its exit from space journey, Endeavour had a cross-country trip to farewell the people before it headed to the museum. The three-day trip allowed the public to watch the shuttle in the skies as it was ferried by a jet and moved through the air at a low-altitude. The first leg was from Houston, with flyovers along Florida’s Space Coast, Stennis Space Center in Mississippi and the Michoud Assembly Facility in New Orleans. In the second leg, it flew low over Tucson, Arizona. 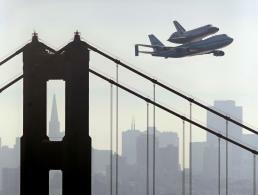 In the final leg, the shuttle was lifted off from Edwards Air Force Base over Sacramento, San Francisco and Los Angeles.